VISAKHAPATNAM: In a tragic turn of events, two Praja Rajyam activists injured in the police lathicharge at Makavarapalem died here on Thursday. The victim, Ruthala Peddi Naidu, was part of a group of protestors who had staged a dharna in front of the revenue office at Makavarapalem demanding compensation for the people displaced by the alumina refinery plant of the UAE-based Anrak company. The police swung into action on Monday as the condition of Ruthala Yerra Patrudu, the Praja Rajyam leader leading the protest, appeared to be deteriorating. When the protestors resisted their attempts to shift Patrudu to a hospital, the cops whipped out their lathis. In the ensuing clash, Peddi Naidu and another PRP worker M Mopada Srinu were injured. The latter sustained serious injuries and was said to be in a critical condition but ironically, it was Naidu who succumbed to the injuries. Srinu who is currently on life support in the Care hospital till in the evening died one hour before. 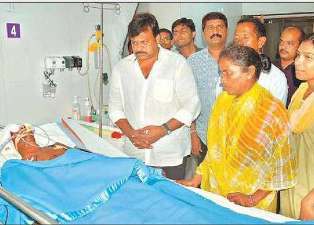 An agricultural worker from Burugupalem in Makavaram mandal, Naidu is survived by his wife Sanyasamma and two children Butchaiah Naidu and Varalakshmi. The daughter of Srinu alleged that her father had died the day he was admitted to the hospital. She accused the doctors of not confirming his death under police pressure. Patrudu also supported her allegation. He demanded `10 lakh compensation and employment to one of the family members of Naidu. He also demanded that the government take action against revenue and police officials responsible for the death of Naidu. But Superintendent of Care Hospital Ramaraju said the condition of Srinu was still critical. District SP Vineet Brijlal, meanwhile, claimed that both Srinu and Naidu had jumped from the police vehicle and dismissed reports that both had sustained serious injuries in police lathicharge. He further said the police had forcibly shifted Patrudu to a hospital on the advice of revenue and medical officials.